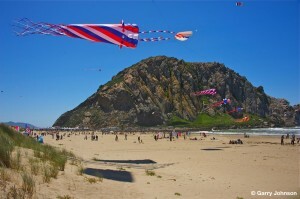 MORRO BAY, Calif. – Once a year, the sky over Morro Bay comes to life as hundreds of colorful kites take flight during the annual Morro Bay Parade and Kite Festival. This year’s event will be held Saturday and Sunday, April 28 and 29. The events begin Saturday with a 10 a.m. parade on Morro Bay Boulevard, and move at 11:30 a.m., to the waterfront parking lot at iconic Morro Rock. Members of the Salinan Tribe will offer the “Blessing of the Wind,” followed immediately by the launch of the kites. Throughout the weekend, professional kite wranglers and pilots will demonstrate their aerial acrobatics to music, flying kite trains and spinning turbines. Lessons on proper kite handling will also be offered. The first 400 children in attendance at the kite festival will be given a free kite to decorate at the Central Coast Funds for Children Tent. The kite festival runs until 5 p.m. on Saturday and continues 10 a.m. to 3 p.m. on Sunday. “I can’t think of a better way to spend a weekend than flying a kite in the gentle ocean breeze, as hundreds of colorful kites paint the sky around you,” said Craig Schmidt, CEO of the Morro Bay Chamber of Commerce, the event’s sponsor. Morro Bay is the gateway to Highway 1, located halfway between San Francisco and Los Angeles. Its famed Morro Rock attracts visitors from around the world. Learn more about the Annual Morro Bay Parade and Kite Festival at www.morrobay.org or call the Morro Bay Chamber of Commerce at 800-231-0592. Large, colorful kites take flight near Morro Rock. Enjoy food, arts and crafts vendors and professional kiters’ aerial acrobatics at the Annual Morro Bay Parade and Kite Festival Saturday and Sunday, April 28 and 29. Parade kicks it off at 10 a.m. on Saturday on Morro Bay Blvd. Free event hosted by the Morro Bay Chamber of Commerce, morrobay.org. Photo credit: Garry Johnson. Parade: 10 a.m. (Morro Bay Blvd., starts at Shasta ends at Market.) *Saturday only. Enjoy food, arts and crafts vendors, and professional kiters demonstrating aerial acrobatics to music. First 400 children receive a free kite. Contact: Morro Bay Chamber of Commerce: 800-231-0592 or Morrobay.org. This entry was posted in KL Archive and tagged festival, Morro Bay, upcoming.